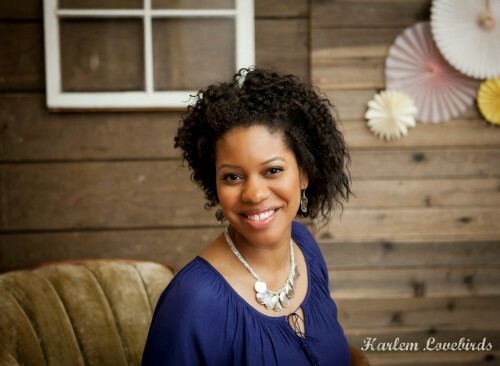 Quiana Agbai is a multi-passionate mompreneur who runs a blog on urban family life called Harlem Love Birds. In addition she runs Destination Wedinars, helping brides plan the destination wedding of their dreams and she just launched Trifecta Media Group with her sisters specializing in media, marketing, graphic design and PR services. For my blog and Destination Wedinars I work alone and for Trifecta Media Group I work with a team. My family is my first priority so once getting my daughter off to school I work between 10AM – 2PM. Each day kicks off with making sure my morning’s blog post is ready to publish, returning emails and getting into NYC for meetings for my brand ambassadorship. Since I do work at home I also spend some time doing domestic things like cooking/cleaning/laundry. What is your biggest challenge as a solopreneur? Time allocation – I’ve been working through different systems for time management to find what works for me. With small children (a 3 year old and one on the way soon) and their unpredictable schedules it’s hard to stick to a hard routine! When your work day gets stressful, how do you de-stress? I usually will just take a nap – always makes me feel better. I also re-affirm the things I am able to accomplish vs. what I cannot. I’ve realized I can only accomplish about 3 major things each day and I’m thankful for those 3 things. What is the biggest/best investment you made toward your brand/blog? My Macbook Air – I’ve been saying for years I’d get one and I just did! If you were given $5k, what would you do with the money? Pay someone to completely take my blog from just a blog to a rebranded, SEO, WordPress website for Brand Quiana. With 3 main profit streams I want my name to be the portal to all I do and it gives me a headache thinking of doing this reorg all on my own. If you could outsource one task so that you can be effective at your brand/blog, what would that be? What is the one piece of advice you wish you knew when you started out? Think in terms of Brand You in everything you do – I just started my blog as an online journal and didn’t think larger than that initially. It could be a good thing though because it came from a very pure/non-profit motivated place! For business: Never Eat Alone – it’s had the most actionable business book I’ve found most helpful for networking; I read it in my early 20s and it set the tone for how I build and maintain relationships. For personal/life: The Bible – all around timeless advice. Quiana unplugs listening to music to uplift her mood. Follow her musings on twitter: @HarlemLoveBirds and engage with her on her favorite platform, Instagram.